조선시대 사대부의 살림집이다. 전주사람인 이내번이 이곳으로 이주하면서 지은 집으로, 예전 경포호가 지금보다 넓은 면적으로 조성되어 있을 때 배를 타고 건너다니던 배다리마을(선교리)에 위치하여 ‘선교장(船橋莊)’이라 붙였다. 안채·사랑채·행랑채·별당·정자 등 민가로서는 거의 모자람이 없는 구조를 지니고 있다. 처음부터 계획 하에 전체가 건축된 것이 아니라 생활하면서 점차 증축되어 오늘에 이르게 되었다. 안채는 이내번이 1700년대에 처음 지은 건물로 알려져 있으며, 조선시대의 여느 상류 주택과 같이 대가족이 함께 생활하던 공간이었므로 (안채의) 부엌 공간을 크게 하였으며 집의 규모에 비하여 소박하고 민가적인 풍취를 나타내고 있다. 안채의 오른쪽으로 연결이 되어있는 주인전용의 별당건물인 동별당은 'ㄱ'자형 건물로 이근우가 1920년에 지었다. 사랑채인 열화당은 이후(李厚)가 순조 15년(1815)에 지었으며, 도연명의 『귀거래사』 중에서 이름을 따왔다고 한다. 지금은 존재하지 않지만 안채와 열화당 사이에는 서재 겸 서고로 사용되던 서별당이 있었다. 대문 밖 바깥마당의 남쪽으로 위치한 넓은 인공연못 (안, 옆, 위)에 서 있는 활래정은 열화당을 세운 다음해에 지었다. 돌기둥이 받치고 있는 마루가 연못안쪽으로 들어가 있는 누각형식의 'ㄱ'자형 건물이다. 한꺼번에 모든 건물을 짓지 않은 까닭에 통일감과 짜임새는 조금 결여되어 있으나, 낮은 산기슭을 배경으로 독립된 건물들을 적당히 배치하고 각 건물의 구조도 소박하게 처리함으로써, 자유스럽고 너그러운 분위기를 풍기고 있다. 또한 소장하고 있는 여러 살림살이들은 옛날 강릉지방 사람들의 생활관습을 알아낼 수 있는 좋은 자료가 되고 있다. 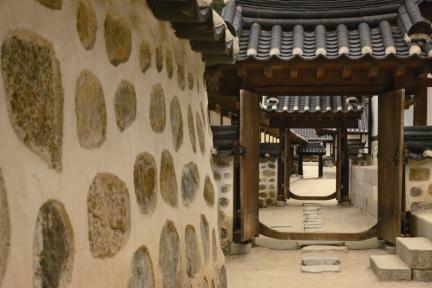 Seongyojang was the house of a high official of the Joseon Period. 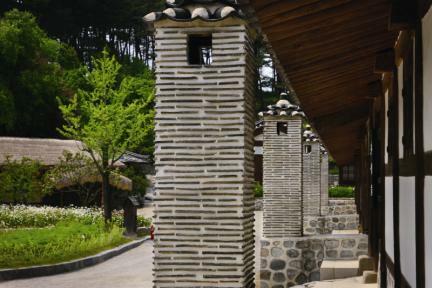 The name Seongyojang originates from Seongyo-ri, the former name of the village in which this house is located, meaning “pontoon bridge village.” The house comprises the anchae (women’s quarters), sarangchae (men’s quarters), haengnangchae (servants’ quarters), detached quarters, and a pavilion. The women’s quarters was built before 1700 by Yi Nae-beon and the eastern detached quarters was built in 1920 by Yi Geun-u. 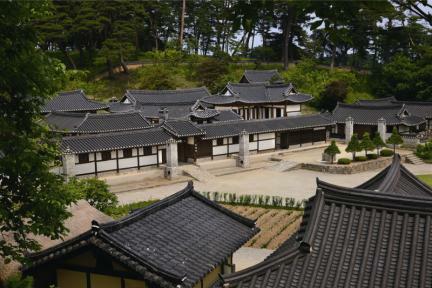 Yeolhwadang, the men’s quarters, was built by Yi Hu in 1815 (the 15th year of King Sunjo’s reign). The western detached quarters used to stand between the women’s quarters and Yeolhwadang, and served as a family library. 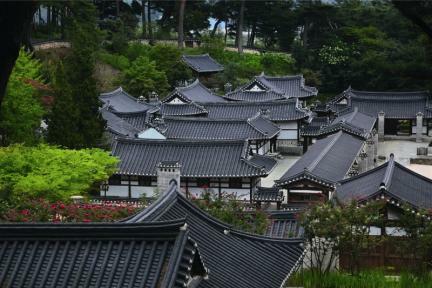 Hwallaejeong, a pavilion located beside the artificial pond outside the gate, was built one year after Yeolhwadang. It is designed such that part of the floor protrudes towards the pond, supported by stone pillars driven into the pond. Several household tools which belonged to this house constitute a good resource for studies of life in the Joseon Period.